Recent Arrival! $1,594 off MSRP! Corolla LE 4D Sedan 1.8L I4 DOHC 16V FWD CVT Classic Silver Metallic 6 Speakers, Automatic temperature control, Brake assist, Dual front impact airbags, Emergency communication system: Safety Connect, Exterior Parking Camera Rear, Front anti-roll bar, Fully automatic headlights, Heated door mirrors, Illuminated entry, Premium Fabric Seat Trim, Radio: AM/FM w/6 Speakers & Navigation, Remote keyless entry, Security system, Speed-sensing steering, Traction control. 30/38 City/Highway MPG Stop by Peoria Toyota today at 7401 N Allen Rd, Peoria, IL 61614 to schedule a test drive or give us a call at 309-693-7000 to make an appointment. To view all available inventory please visit www.peoriatoyota.com. Recent Arrival! $1,252 off MSRP! Corolla SE 4D Sedan 2.0L I4 DOHC 16V FWD CVT Classic Silver Metallic 6 Speakers, All-Weather Floor Liner Package (DISC), All-Weather Floor Liners, Automatic temperature control, Brake assist, Distance pacing cruise control: Full-Speed Range Dynamic Radar Cruise Control (DRCC), Dual front impact airbags, Emergency communication system: Safety Connect, Exterior Parking Camera Rear, Front anti-roll bar, Fully automatic headlights, Heated door mirrors, Illuminated entry, Premium Fabric Seat Trim, Radio: AM/FM w/6 Speakers & Navigation, Remote keyless entry, Security system, Speed-sensing steering, Traction control. 31/40 City/Highway MPG Stop by Peoria Toyota today at 7401 N Allen Rd, Peoria, IL 61614 to schedule a test drive or give us a call at 309-693-7000 to make an appointment. To view all available inventory please visit www.peoriatoyota.com. Recent Arrival! $1,308 off MSRP! Corolla Hybrid LE 4D Sedan 1.8L I4 DOHC 16V FWD CVT Blueprint All-Weather Floor Liner Package (DISC), All-Weather Floor Liners, Automatic temperature control, Brake assist, Distance pacing cruise control: Dynamic Radar Cruise Control (DRCC), Dual front impact airbags, Emergency communication system: Safety Connect, Exterior Parking Camera Rear, Front anti-roll bar, Fully automatic headlights, Illuminated entry, Premium Fabric Seat Trim, Radio: AM/FM w/6 Speakers, Remote keyless entry, Security system, Speed-sensing steering, Traction control. 53/52 City/Highway MPG Stop by Peoria Toyota today at 7401 N Allen Rd, Peoria, IL 61614 to schedule a test drive or give us a call at 309-693-7000 to make an appointment. To view all available inventory please visit www.peoriatoyota.com. Recent Arrival! $1,385 off MSRP! Corolla XLE 4D Sedan 1.8L I4 DOHC 16V FWD CVT Black Sand Pearl 6 Speakers, All-Weather Floor Liner Package (DISC), All-Weather Floor Liners, AM/FM radio: SiriusXM, Automatic temperature control, Blind spot sensor: Blind Spot Monitor (BSM) warning, Brake assist, Distance pacing cruise control: Full-Speed Range Dynamic Radar Cruise Control (DRCC), Dual front impact airbags, Emergency communication system: Safety Connect, Exterior Parking Camera Rear, Front anti-roll bar, Fully automatic headlights, Heated door mirrors, Heated Front Bucket Seats, Illuminated entry, Power moonroof, Radio: AM/FM/CD Player w/Navigation, Remote keyless entry, Security system, SofTex Leather Seat Trim, Speed-sensing steering, Traction control. 29/37 City/Highway MPG Stop by Peoria Toyota today at 7401 N Allen Rd, Peoria, IL 61614 to schedule a test drive or give us a call at 309-693-7000 to make an appointment. To view all available inventory please visit www.peoriatoyota.com. Recent Arrival! $1,430 off MSRP! Corolla XSE 4D Sedan 2.0L I4 DOHC 16V FWD CVT Black Sand Pearl 6 Speakers, All-Weather Floor Liner Package (DISC), All-Weather Floor Liners, AM/FM radio: SiriusXM, Automatic temperature control, Blind spot sensor: Blind Spot Monitor (BSM) warning, Brake assist, Distance pacing cruise control: Full-Speed Range Dynamic Radar Cruise Control (DRCC), Dual front impact airbags, Emergency communication system: Safety Connect, Exterior Parking Camera Rear, Front anti-roll bar, Fully automatic headlights, Heated door mirrors, Heated Front Sport Seats, Illuminated entry, Power moonroof, Radio: AM/FM/CD Player w/Navigation, Remote keyless entry, Security system, SofTex Leather Seat Trim, Speed-sensing steering, Traction control. 31/38 City/Highway MPG Stop by Peoria Toyota today at 7401 N Allen Rd, Peoria, IL 61614 to schedule a test drive or give us a call at 309-693-7000 to make an appointment. To view all available inventory please visit www.peoriatoyota.com. Recent Arrival! $1,167 off MSRP! RAV4 LE 4D Sport Utility 2.5L 4-Cylinder DOHC Dual VVT-i FWD 8-Speed Automatic Magnetic Gray Metallic 6 Speakers, Auto High-beam Headlights, Brake assist, Distance pacing cruise control: Full-Speed Dynamic Radar Cruise Control, Dual front impact airbags, Emergency communication system: Entune Safety Connect, Exterior Parking Camera Rear, Fabric Seat Trim, Front anti-roll bar, Illuminated entry, Panic alarm, Radio: Entune 3.0 Audio, Remote keyless entry, Speed-sensing steering, Traction control. 26/35 City/Highway MPG Stop by Peoria Toyota today at 7401 N Allen Rd, Peoria, IL 61614 to schedule a test drive or give us a call at 309-693-7000 to make an appointment. To view all available inventory please visit www.peoriatoyota.com. If you want a dependable and long-lasting vehicle, buy or lease a new Toyota at Peoria Toyota. Our Illinois Toyota dealer sells the full Toyota model lineup, so you can shop for a new Toyota sedan, truck or SUV all in one place. If you want a new sedan, check out the new Toyota Camry, Corolla or Avalon. Need something a little bigger? Test-drive a new Toyota RAV4, Toyota C-HR or Toyota Highlander SUV. The new Toyota Prius is perfect for those who want to reduce their carbon footprint, and the new Toyota Tacoma or Tundra are ideal for drivers who need to tackle tough jobs. Shop our new Toyota inventory to find the car that speaks to you and buy a new Toyota today! 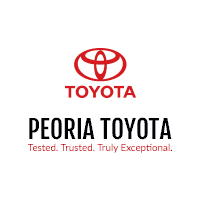 Peoria Toyota is located in Peoria, IL at 7401 N Allen Road. Peoria Toyota is a short distance from Dunlap, Morton, Washington, East Peoria, Pekin, Chillicothe, and many other locations in Central Illinois. Stop by today to shop our large inventory of new and used vehicles and take a test drive. We look forward to serving you.